On the whole, if you asked the staff of ten restaurants what they hated the most about their line of work, the kitchen staffs from each of these restaurants would tell you- the commercial deep fryer is a dreaded machine, lurking there, waiting to be cleaned. From filtering the oil, to actually changing the oil and dealing with the vents- what a mess! Most staff do not relish the idea of waiting for the temperature to drop, dealing with the downtime, the potential burns, grease splatters and often slipper floors after. Training new employees to clean the fryer can be problematic- some employees are too young to even be allowed to touch it, let alone clean it. However, there are some things you can do to train employees to deal with the dreaded deep fryer in a better way. First you have to get the fryer ready to be cleaned, and this involves letting the oil cool. Beginning with this, you have to realize that the fryer is kept at a constant heat- usually right around 350F, and that takes a long time to cool properly. Turning the fryer off, unplugging it, and allowing the oil to get down to a workable temperature is important. The highest the temperature should be when cleaning is roughly 150F. Once it has reached this temperature or lower, you can then begin the cleaning process. Once the fryer oil has cooled, then comes draining it of the oil. As you allow the oil to drain from the vat, you will want to take any baskets or utensils used and wash them separately. After all of the oil is removed from the fryer, then you have to scrape it clean. Particle build up is a big problem for fryers- and if the scraping is not done properly, not only will the new oil be compromised and make it so the food does not taste the best that it could, but, it can also cause mechanical problems and safety issues with the fryer itself. Using a metal spatula, scraping down the sides and being sure to get into the corners is usually best. For every type of fryer, there may be a different way of cleaning- and this is the actual deep cleaning that is so vital to the continued maintenance of the machine. Fill the fryer with water and a soap solution made for cleaning deep fryers, and plug the fryer back in- turn it on and allow the water to come to a boil. Once it has reached a good, rolling boil, then unplug the fryer again, and allow the water to cool, draining the soap solution just as you did with the oil. Rinse with a rinsing agent, and then, rinse it again with water. Generally, a decent solvent will take care of the outside of the fryer. Sometimes you may find that you have to allow the solvent to sit to make sure that you have removed any caked on grease. Wiping the fryer down, making sure to give it a good once over with dry towels or cloth can help your fryer to not only look better, but smell better also. Once this is all done, you have to make sure that the area around the fryer itself isn’t still greasy. 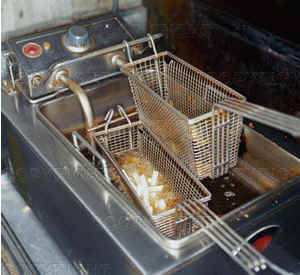 Often, throughout the normal course of a day, the area in front of a fryer gets a thin layer of grease which can cause slip and fall accidents. As this is the last step, the fryer, and the area around it should be ready to run again with the next shift. The alternative… get a Filta technician in to manage your fryers.